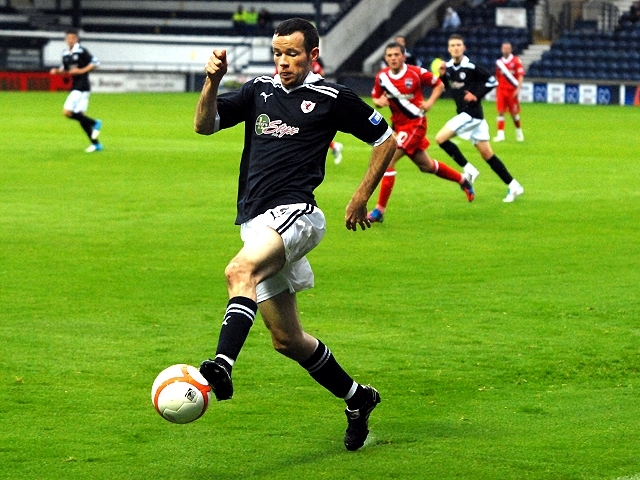 Raith Rovers and Ross County played out an entertaining one all draw tonight in difficult conditions at Stark’s Park. By anyone’s standards Raith have had something of a hectic summer break. 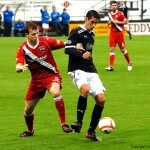 Several players have left including long term captain Iain Davidson and fan favourite John Baird. As well as this the seasons preparations were disrupted by manager John McGlynn heading to take over the reigns at Tynecastle while vice chairman Turnbull Hutton has become something of a peoples champion due to his, and the boards stance on the newco situation. As a result of this it was something of a relief to get back to playing football and new manager Grant Murray took charge of the side for the first time against last seasons runaway First Division champions Ross County. Raith started with new full backs Jason Thomson and Eddie Malone on either side while youngster Ross Callachan lined up in the middle with Alan Walker. New signing Grant Anderson started wide right while Graham partnered Pat Clarke up front. 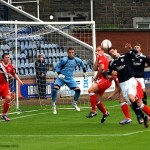 It was Raith’s front pairing who combined first after 2 minutes. Graham fed the ball to Clarke who saw Anderson in acres of space wide on the right. With room to run into he opted to shoot early, his low drive fizzing just past the left hand post. Ross Callachan was next to try his luck. Playing a one two with Hamill he found himself receiving the ball back inside the box but his tame effort was easily held by County keeper Michael Fraser. Despite the bright early start from Rovers it was Ross County who took the lead after 8 minutes. Coming at the end of a good spell of possession, Colin McMenamin received the ball out wide on the right hand touchline. Passing it square to Morrow on the edge of the box, he sidestepped an Ellis slide tackle and passed the ball past McGurn into the left hand corner of the net. 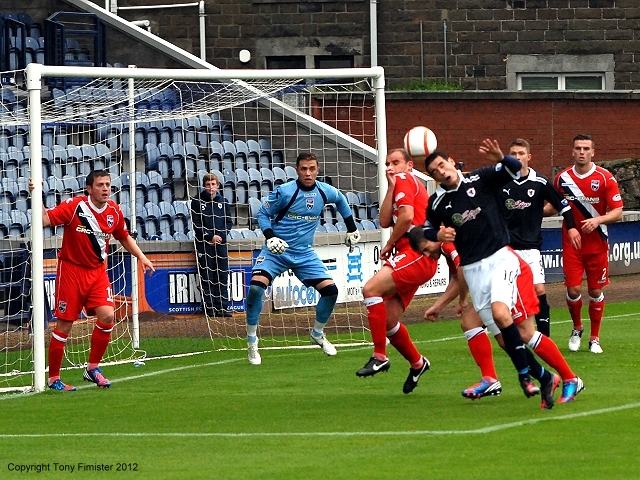 The goal didn’t seem to unsettle Raith though and they were level with their next meaningful attack after 16 minutes. Receiving the ball out wide, Grant Anderson turned his man wonderfully and headed into the County half. Showing just how quick he is he outpaced Fitzpatrick as he ran the length of the half, hitting the bye line before sending in a wonderful cross for Graham to head past Fraser from close range. a threat from wide left. Despite their prominence in the game it was a different trio who almost combined to give County the lead. A long ball from Rocco Quinn caught out Malone, allowing Brittain to knock it down for Kettlewell who should have done better with his half volley from 8 yards. The final chance of the half fell to Raith and again it was Anderson who caused the danger. His deep cross was meant for Clarke but was just too high for him, it fell kindly for Graham though and his first time effort went just over. The second half kicked off with no substitutions but it did see a tactical change with Anderson swapping with Hamill, allowing him to try out his pace against right back Jonathon Bateson. Raith didn’t have an early attempt to use the ploy though as Ross County seemed to up their work rate early in the second half. A ball from Morrow allowed Vigurs a sight at goal but his snap shot went over the bar. On the 55th minute County missed a golden opportunity to go in front. A long ball forward found Richard Brittain, his dummy took him away from Dougie Hill but as he found himself with a free run at goal his shot from an acute angle was so poor it ended up going out for a throw in. As conditions underfoot worsened the game started to get bogged down and become scrappy. Ross Callaghan though was starting to show his worth in midfield and in particular giving ex Celtic and Kilmarnock midfielder Roco Quinn a difficult evening. 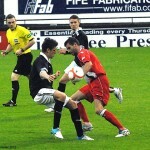 He was also showing a passing range that had led former boss John McGlynn to compare him favourably to Iain Davidson. Both sides tried to liven up proceedings with substitutions. Craig and Corcoran came on for Vigurs and McMenamin while Raith brought on their first trialist (number 16), a striker for Brian Graham with 25 minutes remaining. The trialist seemed eager to get involved and immediately tried to link up with Clarke, who tried his luck from 30 yards out, his ambitious drive glided over the sodden turf and only just sneaked past. While Raith’s attempts to play football had been both noticeable and admirable there was a tendency to overplay in the wrong areas at times and as Callachan gave possession away to Morrow 30 yards from goal the youngster was relieved to see the ex Hibs man send his shot just over. It was Callachan’s last involvement and he was replaced by a second trialist (12) who took up his position in the middle of the park. 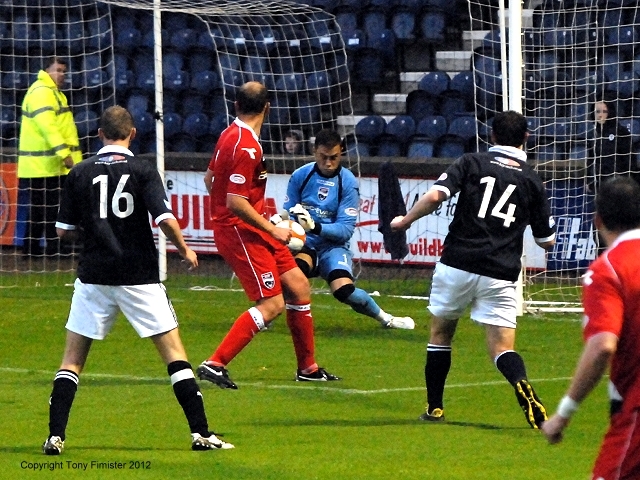 Raith spurned a great chance with 10 minutes remaining. Hamill played the ball in to trialist (16) who’s clever flick found Walker but as he approached the 6 yard box from an angle he miscued his shot horribly and sent it well wide. More good work from trialist (16) saw him feed the ball wide to Anderson but with 4 Raith players waiting his cross into the box he opted to shoot and screwed it wide and into the stand. The full time whistle brought an end to a good game that both sides would have taken something out of. While Ross County looked the livelier and passed the ball around marginally the better for most of the game, Raith were unlucky not to win it and deserved the draw. From the debutantes, Malone looked solid while the new right hand pairing of Thomson and Anderson showed signs of encouragement for the season ahead. In midfield Callachan impressed while the two trialists looked comfortable in possession and in particular number 16 looked lively up front. Laurie Ellis was also as reliable as ever and attention now turns to his big day as he celebrates his testimonial against Hearts on Saturday at Stark’s Park. Grant Anderson picks the ball up on the right, cuts in and fizzes a shot wide. Goal County. Morrow tucks the ball away in the corner after a slip in defence. Goal Raith. Great run and cross from Anderson headed home by Graham. 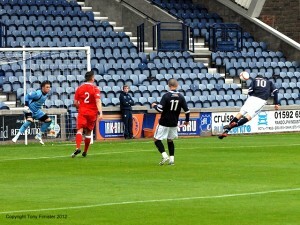 Graham header parried by Fraser. Graham half volleys another Anderson cross just over. HT 1-1. Decent game with the better chances falling to the home team. Vigurs shoots over for County. Craig + Corcoran on for Vigurs + McMenamin for County. Trialist on for Brian Graham. Clarke skims a long range shot just past the post. 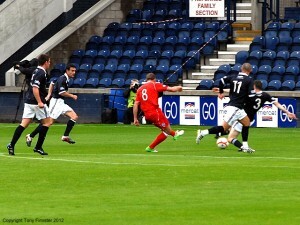 Trialist 16 with a lovely touch to Walker who sclaffs his shot. MacPhee for Quinn and Donaldson for Thomson. Penalty shout for Raith for a shove in the box but nothing given. Overall, an encouraging performance in a game played at a decent tempo. Malone and Ellis were solid, Anderson was lively and Clarke came onto a game in the 2nd. 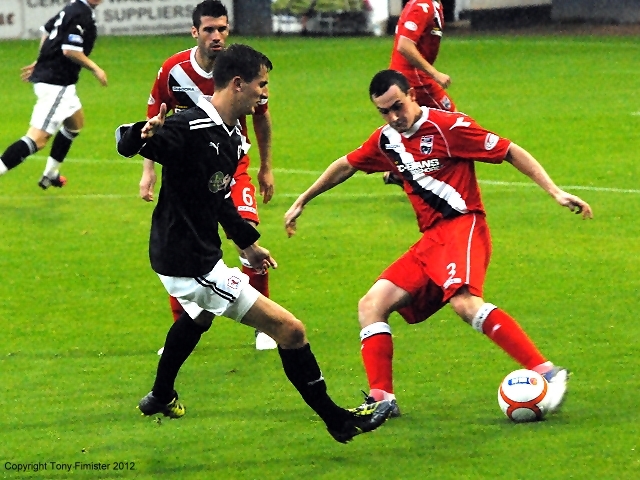 Trialist Spence had some intelligent runs and good touches. Note that there is no sound for the first section. Davie Hancock spoke to new Manager Grant Murray after his first match in charge.